The ProToolsNow Diamond Tip squeegee series is a full line of diagonally shaped, handheld application tools. They’re designed to meet the challenge of hard–to–reach areas, with square edges and 20–degree angled corners on both sides. And the raised area in the center of the tool gives you a secure, slip–resistant grip, even when wet. The softer Diamond Tip versions make great squeegees because they are engineered to provide a firm texture that delivers pressure to the point–of–contact with ease, while their special material prevents scratching. 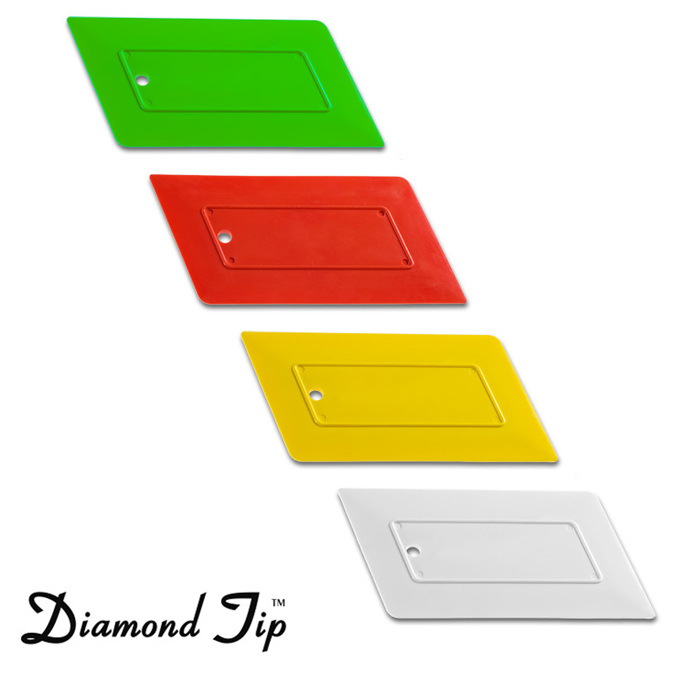 Diamond Tip hard cards are ideal for bumping edges, and especially handy during the shrinking process because of their high heat–resistant material. These hard card Diamond Tips are made from a scratch–resistant material, with easy grip ridges that make them the tool of choice for laying down those troublesome “fingers” that pop up during the heat–shrinking process. Available in soft, flex–firm and hard versions, Diamond Tips are an all–around favorite for window film, PPF and various vinyl graphics, signs and are also becoming very popular with dealers who install vehicle wraps.